0n the 17th of June an important milestone was reached at a small gathering held in a forest managed by PF Olsen near Rotorua. This is where the Minister for the Environment, the Hon. 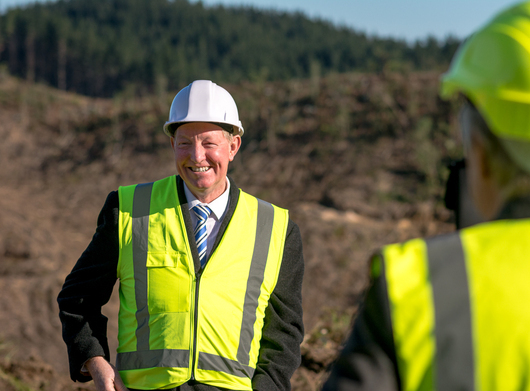 Nick Smith, and the Associate Minister for Primary Industries Hon Jo Goodhew announced the Government's intention to advance the National Environmental Standard (NES) to the next stage of public consultation. This process is planned to commence in July after which, subject to modifications that may arise, the NES is expected to advance to a legal drafting stage. The Hon. Nick Smith announces the decision to take the NES to the public consultation phase at a gathering at Paengaroa forest in the Bay of Plenty. For a number of years, a dedicated team of individuals have been working away with the aim of creating a National Environmental Standard for Forestry. Comprising members of the forest industry, regulatory authorities, environmental NGO's and staff from the Ministry of Primary Industries and the Ministry for the Environment, this group has wrestled with how to codify the plethora of different RMA rules impacting forestry activities around the country into one cohesive code that can deliver the same, or better, environmental performance at less cost, delay and uncertainty to the industry. PF Olsen's Environment Manger, Kit Richards, one of the NES working party members, believes this development marks an important milestone. In everyone's mind, the objective has been to develop a new framework that enables the industry to maintain, or improve, its environmental performance but in a much more streamlined, efficient and cost-effective way. The work to date has been significant, not only in terms of the cooperative development involving the different participants but also the in the development of tools to support the legislative framework. These tools include a national web-based erosion susceptibility layer, fish spawning information and a threatened fish species probability model. The 400 hectare Paengaroa forest venue at which the announcement was made provided a great working example of the complexities that forest managers face, including a range of erosion terrains, protected ecosystems, wetlands, archaeological reserves and the potential for the presence of rare native fish. Invited guests discuss aspects of the NES at a PF Olsen-managed harvesting operation at Paengaroa forest in the Bay of Plenty. Click here Minister's Press release. Forest Biosecurity – What are we doing to help reduce the risk? Strategy - outcomes or beliefs? Bio-oil trial - the results are in! What can we aspire to? Ray Thomas found PF Olsen "approachable and very much our advocate"
Where have all the haulers gone? Clarky's Comment - where will the labour come from? Clarky's Comment - A billion trees – The plan? National Environmental Standard for Plantation Forestry Launched! What is involved in keeping visitors to our forests safe? 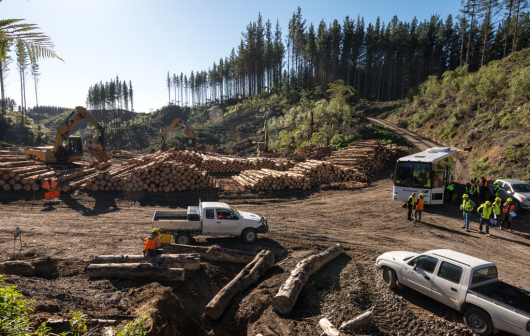 Where is New Zealand’s forestry industry heading by 2025 and 2035? Old Dogs – New Tricks! Has RMA future proofed NZ for sustainable growth? PF Olsen 2016 Annual FSC Surveillance Audit completed with good results. Where are the log prices going? PF Olsen crews work with University student to study workplace fatigue. Random drug and alcohol testing in PF Olsen’s operations has just entered its 7th year. Whats going on at the PF Olsen Treestock Nursery? What’s going on at the PF Olsen Tree Stock Nursery? Clarky's Comment - September, To Prune or Not to Prune? Genetic improvement "doesn't happen overnight, but it does happen"
What is happening at PF Olsen Nursery? What Research is Being Funded by the Forest Grower Levy? What will happen to the price of logs on the wharf? Who owns the logs PF Olsen manages for export? Correction to last month's "Programme to Make Log Loading Safer"
What's happening at the PF Olsen Nursery? Why on Earth a wood house? Why should you plant container grown trees? Change and Challenge a Major Theme for Australian Forestry in 2012 – Same Again for 2013? ANZ Sums up Impending "Wall of Wood"
Why is housing so expensive in New Zealand? Cleaner and greener harvesting operations, and better performance! SWI Keeps on Innovating – who said it “cant” be done? Solid Wood Innovation: PF Olsen gets first hand experience with resinous wood. Differentiating Pre-1990 or Post-1989 Forest Land? Should I Wait Until 2012 to Decide Whether or Not to Claim Carbon Credits? "Excellent, professional service has added value to our forestry investment"
"PF Olsen achieved full compliance with Regional Council requirements"
Clarky's Comment - March 2010, Why Aren't New Forestry Planting Rates Burgeoning? Clarky's Comment - October 2009, Who will do the new planting? Can an Understanding of the Global Commodity Market and International Trends Assist us in Timing our Harvesting Better? New Opportunity Challenges Conventional Wisdom on Best Time to Harvest your Forest? End of an Era for Rayonier? WOOD MATTERS Keep up with PF Olsen news and updates.